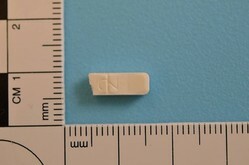 Two men in Santa Cruz have died after taking a counterfeit version of the anxiety medicine Xanax at a party. The two deaths involved a 19-year-old and 29-year-old man - while a third man was taken ill after taking the medicine but survived. The cases follow at least three fatalities and three hospitalisations in San Francisco reported in October. Xanax - which is known by the generic name alprazolam - is a benzodiazepine that is used to treat anxiety and panic disorders but is also mis-used for recreational purposes. At the moment the nature of the counterfeits tablets found in Santa Cruz has not been revealed, but an analysis of the tablets implicated in the San Francisco found they contained high levels of the opioid analgesic fentanyl, a powerful central nervous system depressant. Alprazolam and other benzodiazepines can also be fatal in their own right, especially if mixed with other drugs or alcohol, and according to a 2012 study kill a few hundred people a year in the US. The drug class has risen to notoriety in the wake of the deaths of several high-profile figures, including actors Heath Ledger and Brittany Murphy and singer Amy Winehouse. The perilous nature of the drug can make it particularly hard for healthcare and enforcement services to establish if an injury or death is related to a counterfeit or genuine, diverted tablet.